The community’s need was real. The buildings and equipment were new. Many of the doctors, nurses, and staff were dedicated. The funding was available. But something was missing, and the lack would prove fatal. If you do not live in the Los Angeles area, you may not have heard of Martin Luther King Hospital. But the history of this much-needed hospital gives us a lesson on how not to provide health care. After the Watts riots of 1965, Los Angeles officials finally listened to complaints by the black community, including lack of a nearby public hospital. A new hospital was built in South Central Los Angeles, which then was largely African American. In 1972 the hospital opened with 537 beds and active outpatient clinics. The emergency department was upgraded to a trauma center and was extremely busy. The hospital changes its name. For centuries the name “hospital” denoted a place where doctors and nurses dedicated their lives to caring for the sick and injured. But somehow that noble ideal no longer is considered “intellectual,” so many hospitals were renamed to emphasize teaching rather than patient care. Though I spent my professional life in clinical teaching, I found this change problematic. I worried that devaluing patient care was not a positive sign. The place where I spent most of my time used to be called Los Angeles County General Hospital, but it was renamed Los Angeles County-University of Southern California Medical Center. Harbor General Hospital was renamed Harbor-UCLA Medical Center. 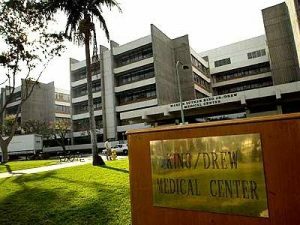 Instead of affiliating King Hospital with one of the two existing medical schools, USC or UCLA, it was affiliated with the newly established Charles R. Drew University of Medicine and Science. Drew was a black physician who was a pioneer in blood transfusion. The new name was King-Drew Medical Center. In real life, excellence and control are often conflicting goals. In real life, we may have to choose which we value more. We may have to choose whether we want to control health care, or whether we want quality health care. This is true on the local level, and it is equally true on the national level. Look at the waiting times for appointments with specialists or for elective surgery. The months-long waiting times at King were similar to the waiting times for all patients in Canada and Britain. Does that tell us something? The hospital gets a nickname. When I worked at LA County-USC Medical Center, patients – including African American patients – often expressed relief that they were there rather than at King, which they called “Killer King.” Paramedics reported that patients from South Central often asked to be taken to “Big County,” even though the trip was longer. This was a sign that the hospital was serving interests other than those of the black community. Patients reported incidents of bad medical and nursing care, but we had no way to verify these stories. Sometimes a sad tale appeared in the Los Angeles Times, but such reports were rare. It was difficult to tell whether the rarity of these reports was due to the rarity of cases of bad care, or to the Times’ fear of being politically incorrect. I believe it was James Baldwin, the noted African American writer, who said that when he was at a dinner party, he would make an intentionally absurd remark. If nobody corrected him, he knew he was in the presence of racists who expected less of him. The same principle applies here. Withholding criticism is a sign of condescension, not respect. As years passed, more stories of bad patient care surfaced, including medication errors and neglect resulting in deaths. But now these stories were supported by official inspections. All hospitals must be inspected every few years by the Joint Commission. Often these inspections are conducted together with state officials, who have the power to revoke a hospital’s license, and federal officials, who have the power to deny Medicare and Medicaid payments and bankrupt the hospital. Time after time, deficiencies were reported. Time after time, hospital officials promised to correct these deficiencies. Time after time, they were not corrected. Time after time, the Board of Supervisors, which oversees all county institutions, made positive statements but did little. There are five supervisors, elected to oversee a county of 34,520 square miles and over 10 million people – the most populous county in the nation, exceeded by only eight states. With the continuing influx of Latino immigrants, legal and illegal, the population served by King Hospital shifted. The majority of patients were now Latino. The staff of the hospital also shifted and was multiethnic. The demographic shift made it more acceptable to criticize the hospital. This fact is regrettable, but it is no less a fact. The hospital changes its name again. After years of threats, the federal government made its final threat to remove Medicare and Medicaid funds, without which the hospital would have to close. Decades too late, the hospital was placed under the umbrella of Harbor-UCLA Medical Center as a last-ditch effort. The hospital became King-Harbor Medical Center, but the change was largely cosmetic. Several residency training programs, which had been closed by order of the medical specialty boards, remained closed. One problem was that staff had used Tasers to subdue unruly psychiatric patients. The final nail was driven into the coffin when Edith Rodriguez, a 43-year-old Latina woman, lay on the floor of the emergency department for at least 45 minutes, vomiting blood and writhing in pain. The staff refused to help her or call a doctor, because (they said) they had already determined that she was not seriously ill. Meanwhile a janitor mopped up around her. Her boyfriend twice called 911 for help, but the operator correctly pointed out that the woman was already in a hospital. Finally the boyfriend asked for help from hospital police officers. They found that the woman was wanted on a parole violation, so they helped her into a police car to take her to jail, where she finally would be seen by a doctor. But it was too late. The woman died of a perforated bowel. She received more sympathy from the police than from the hospital staff. The police remembered their oath to protect and to serve the public. The hospital staff forgot their oath. Soon after, a final inspection again revealed serious deficiencies, and federal funds were withdrawn. In 2007 the emergency department closed, and soon after the rest of the hospital closed. You couldn’t fix something that was intent on staying broken. In 2015 a smaller version of the hospital, dubbed a “community hospital,” reopened. It has only 133 inpatient beds, as contrasted with 537 beds in the original hospital, but the emergency department is well equipped and, as expected, very busy. The new facility is said to be “state of the art” and “cutting edge,” but so was the old one when it was opened. Thus far things seem to be going better than before. But based on the government’s record of rarely learning from its mistakes, we will withhold judgment on whether “Killer King” is really dead, or only lying dormant, waiting for the opportunity to reappear. The newest of Los Angeles County’s public hospitals, and the one favored with the most money per patient, consistently failed to provide adequate care and was forced to close. What can we learn from this sad story? New facilities and more money don’t guarantee high quality. All they guarantee is that the money will be spent on something. Health care plus politics make a potentially dangerous mixture. Withholding needed criticism demonstrates apathy, not kindness. We can have open borders, or we can have a welfare state, but as Milton Friedman pointed out, we can’t have both. Even the richest nation can’t provide welfare benefits, education, and health care to a limitless influx of immigrants. Deficiencies at King Hospital were pointed out and finally ended by a higher authority. But when the federal government runs things, there is no higher authority to correct abuses. That is why we divide authority between the federal government, the states, the counties and cities, and the private sector – a wise plan. The National Health Service in the UK is held up as a role model by many people. But there, cancer-survival statistics are dismal, and patients were forced to drink from flower vases when nursing staff brought them no water. This is a role model? Advocates of government-run health care imagine it will be Medicare for all, but it is more likely to be Veterans Affairs health care for all. Government-run health care is at least as likely to be inadequate as is privately funded health care. When was the last time you heard of a patient writhing in pain on the floor for 45 minutes without being helped in a private hospital? When politicians promise health care for everyone, we have a right to ask: What kind of care? The kind politicians get with their excellent congressional health plan? Or the kind Edith Rodriguez got? Yes, despite the buildings, equipment, and funding, something was missing: a realization that a hospital is a place where the sick and injured are cared for by dedicated professionals, and not a place where politicians further their selfish agendas at the expense of patients and taxpayers. Do you suppose, just possibly, that there might be a lesson here? Do you think, just possibly, that empowering the government to solve all our problems might have a down side?